Christin Phillips, a Bella Vista homeowner stands in front of her home, in Philadelphia, Thursday, August 9, 2018. Phillips is challenging her property assessment. Christin Phillips received an unwelcome piece of mail this spring: the city's latest assessment on her Bella Vista rowhouse. It suggested that her home's value was about $130,000 above the nearly identical house next door, and that her tax bill next year would top $9,000 — more than double what she paid this year. But the city, it turns out, had incorrect information: Her house, blocks from the Italian Market, was listed as a duplex but is actually a single-family residence. Errors are inevitable in mass appraisals involving hundreds of thousands of properties. But an Inquirer and Daily News analysis of recent assessment data and sales prices found that assessment inaccuracy remains a stubborn problem in Philadelphia. More than a dozen neighborhoods — including Hunting Park, Southwest Philadelphia, and Fairhill — are overvalued, according to the newspapers' review. Others — University City, Point Breeze, and Center City — are getting relative tax breaks. More than 35 percent of homes — totaling more than 165,000 — are overassessed, the analysis found, meaning those homeowners are paying more than they should in property taxes and essentially subsidizing others across the city. 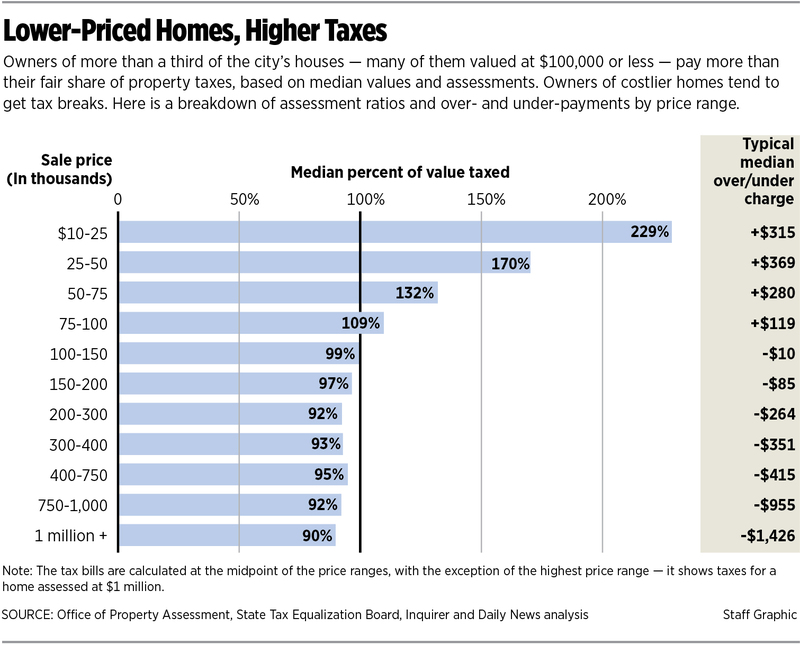 Lower-priced properties on average tend to be overassessed, while owners of higher-priced properties may be paying too little in taxes. Philadelphia assessment officials disagreed with the Inquirer and Daily News analysis and said they stand by their calculations. But the latest revaluation appears to echo a long-standing problem. The newspapers' findings were similar to what an expert commissioned by the city controller found in 2013, and to a property analysis decades earlier by the Reinvestment Fund, a Philadelphia nonprofit that works to help low-income communities with affordable housing and other issues. "It is a persistent pattern," said Ira Goldstein, who conducted that study and is the fund's president of policy solutions. "A model that produces these kind of biased results is a problematic model." Confusion and inaccuracy surrounding Philadelphia's assessments are exacerbated by the fact that the reassessments are not only about fairness; they also increase tax revenue — a major source of the billions of dollars the city spends each year. Elsewhere in Pennsylvania, reassessments are "revenue neutral" and are aimed at equalizing tax burdens. In Philadelphia, tax rates are not adjusted when assessments increase. The city's 2019 assessments included a 10.5 percent increase in the median value of a single-family home. Rob Dubow, the city's finance director, defended the practice of increasing revenue alongside assessments and said that any reassessment — revenue-neutral or not — angers some residents. "The mere fact of getting it accurate and getting it more accurate every year means that there are properties whose values are going to change," he said. "So there are always going to be people who are unhappy with paying." Phillips, the Bella Vista homeowner, said she is all for additional tax money to fund Philadelphia's schools. As a commercial appraiser, she understood the source of the city's error for her property. Assessors mistook her house for a duplex — which would have made it more valuable, and which it was when she bought it in 2016. She converted it into a single-family residence. Officials have visited her property, and an appeal she filed on the assessment is pending. But other homeowners have asked Phillips to use her expertise to review their new 2019 assessments, and she said she has struggled to make sense of the city's methodology. "It's not transparent at all, and that's a problem," she said. "That's a very big problem because no one understands it." Based on median home values and the city’s estimated market values, entire neighborhoods are overassessed; others underassessed. Here is a breakdown of which neighborhoods are overassessed or underassessed. An "assessment" is the percentage of a property's value that is subject to taxation. Philadelphia assesses properties at 100 percent of market value, meaning that homeowners should pay taxes on the amount for which they could sell their home in a traditional, arm's-length transaction. Assessment officials said that the increases in the 2019 assessments of residential properties resulted from the strength of the city's booming real estate market. But City Council members were not happy. Citing outrage from residents who will face sizable tax hikes due to those new values, Council rejected Mayor Kenney's proposed 4.1 percent property-tax increase and retained a Massachusetts firm to audit the city's assessment methods. The firm, J.F. Ryan Associates, is expected to deliver its findings in September. Council president Darrell L. Clarke said he hoped that the audit would lead to changes. "There clearly is some concern," Clarke said after being told about the Inquirer and Daily News analysis. "If we're going to impose additional taxes or not impose additional taxes, it should be done based on accurate information, and we've been saying that for quite some time." Officials have said that the city's assessment office was cooperating with auditors. "We are confident in our assessments, and confident that this audit process will alleviate the concerns of Council members and residents," said Jim Engler, who takes over Saturday as Kenney's chief of staff. What did the Inquirer and Daily News find? Beyond homeowners' shock at 2019 assessment increases, the analysis of recent sales and property data found that more than 165,000 Philadelphia homes are overassessed and about 133,000 are undervalued. An additional 161,000 single-family homes, or a little more than a third of all within the city, are assessed at or within 10 percent of their true market value. To analyze Philadelphia's assessments, the Inquirer and Daily News compared the city's assigned market values to the recent sales prices of nearly 23,000 properties that sold in 2017. Using state standards, the analysis removed outliers that likely were not arm's-length sales — such as transactions for small amounts between family members. The newspapers used a map of 55 neighborhoods to sort sales geographically. Although it splits the city into well-known neighborhoods, the city's assessment officials said they instead use smaller areas defined by trends in sales data. The Inquirer and Daily News found that homes that sold for between $25,000 and $50,000 are valued 70 percent higher than they should be, based on the median ratios of assessments to sales prices. That would inflate the tax bill for a $37,500 home — the middle of that range — by about $360 annually. By contrast, owners of more expensive properties were getting breaks, the analysis found. Homes that sold for between $1 million and $2 million have assessments that are nearly 11 percent below their actual value and tax bills about $2,000 less than they should be. Exceptions exist in every category, but the analysis found that some neighborhoods where homeowners experienced significant increases in their 2019 assessments have accurate median market values — and in some cases the tax increases were warranted. Some, like Adam Moffitt, have experienced both ends of the spectrum. He bought a West Mount Airy rowhouse last year for $107,000, city records show. His assessment at that time was $83,700 — much lower than the sales price and therefore likely underassessed. But the new assessment he received this year would increase his tax bill by 48 percent, to about $1,700 — without taking into account a homestead exemption that reduces his bill. His assessment is now $17,000 more than he paid for the home, according to property records, and the city increased the value of every home on the block to at least the same as Moffitt's. 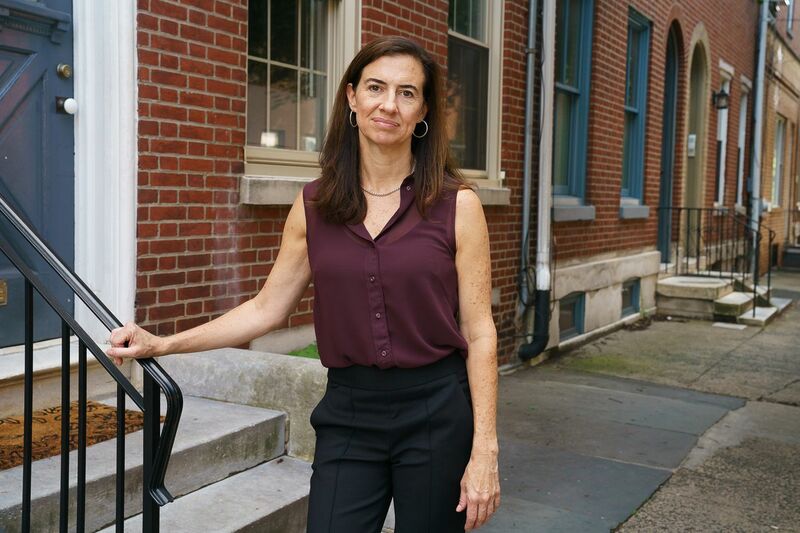 Philadelphia's new assessments this year appear to be even more off the mark than those of its surrounding counties — which have not reassessed in decades. Bucks, Montgomery, Chester, and Delaware Counties each have a lower percentage of overassessed properties compared with Philadelphia, according to an Inquirer and Daily News analysis of 2017 sales. But whether properties are over- or underassessed, inequities violate the state constitution's uniformity clause, which requires that assessments are the same on all types of properties throughout a county. There is a state board that tracks property assessments and attempts to monitor its fairness. It issues annual reports based on sales and assessments in each county, but has no enforcement power, cannot order counties to reassess, and does not check whether self-reported county data is accurate. Its analysis of 2017 sales found that Philadelphia is doing well, on average, of assessing properties at their market values. The Philadelphia Office of Property Assessments said its own internal analysis had found no statistical evidence that sales price range would affect over- or underassessment. It said that the Inquirer and Daily News didn't remove enough outliers, and that the city's analysis, based on a much smaller portion of sales and calculated with different methods using a different time period of sales, is more accurate. Dubow, city finance director, said that although assessments could always be improved, the city's system was not broken. "But if your question is how can it get better, every year they're doing everything they can do to improve it," he said. Assessment officials said the highest- and lowest-priced properties are typically the hardest to value. Buyers of low-end properties, they said, often pay cash and are looking to flip properties, which can throw off sales prices and property data. Differences in luxury amenities of high-end properties, meanwhile, can cause sales prices to vary widely, city officials said. It is impossible to perfectly assess every property, said Robert P. Strauss, a professor of economics and public policy at Carnegie Mellon University. But Strauss said the Inquirer and Daily News findings were similar to the analysis he completed for then-controller Alan Butkovitz when the city scrapped its old system four years ago. "It's a game of cat and mouse, if you will, to get the right data and keep it current," he said. Strauss has examined the amounts that Pennsylvania counties spend to keep their assessments updated. In most cases, he said, it's not nearly enough. Correcting the data to fix inequities can also come at a political cost. "If they spend enough money and make everything fair, the people whose assessments will go down relatively will never complain but the people whose assessments will go up will complain very bitterly, and they'll complain noisily," Strauss said. But he pointed out a notable exception to that principle: "Low-income communities are less likely to bite politically than high-income communities in a big city." The assessments and the ensuing tax bills have been a source of controversy for decades. A 2008 analysis by the Inquirer found city properties were assessed at a fraction of their market value and were off by an average of 39 percent. Aimed at doing away with an unfair system that was difficult for property owners to understand, Philadelphia's Actual Value Initiative (AVI) went into effect in 2014. Under AVI, the city aims to keep assessments at 100 percent of market value. The Office of Property Assessment said it had updated all residential properties twice since the initial update under AVI. "We've seen remarkable improvement with every project," said Kevin Keene, the city's director of mass appraisal. Joseph Bright, a Philadelphia lawyer who specializes in taxation, said he saw progress. "Generally speaking," he said, "I think the city is doing a much better job of keeping up with real market value than they have in the past." But the patterns found in the most recent Inquirer and Daily News analysis have persisted since AVI was implemented, according to reviews of sales and property data from prior years. And after hearing from residents who experienced large increases this year, City Council members have expressed doubts about the system. "They assured us that after this initial [AVI] assessment … that the most assessments would go up in any one year would be from 3 to 5 percent," said Councilman Mark Squilla. "They still don't have this down. We need to throw some protections in place to make sure that our constituents and our residents know we have their back." What can residents do about their assessments? Moffitt, the West Mount Airy owner, is now one of hundreds of homeowners who have already filed 2019 appeals to the Board of Revision of Taxes (BRT) ahead of its Oct. 1 deadline. Property owners who disagree with an assessment can contest it — but the system can be confusing and it can take a long time to resolve appeals. First, residents can file a first-level review application to the Office of Property Assessment. This year, the city said it received more than 20,000 such applications. More than 5,000 have been processed so far, and 1,570 have resulted in changes to assessments and tax bills. Property owners can also appeal to the BRT, as Moffitt did. One path to a successful appeal, according to the BRT, is to prove "the estimated market value of the property is not uniform with similar surrounding properties." Although homeowners can compare their assessments with nearby neighbors', that advice is incomplete. Assessment percentages should be uniform at all value ranges throughout a given county — in this case, Philadelphia — not just the neighborhood. A three-story rowhouse in South Philadelphia that sells for $200,000 should have the same assessment as a two-story detached home in Mount Airy that sells for the same price. The style and location aren't relevant — what matters is the value. The city's online records do not give property owners the ability to search by sales price or assessment amount, so homeowners can't compare the tax bills of others whose properties should be valued the same. City officials said neighborhood was simply the best indicator of market value. But a lack of transparency and information can put taxpayers at a disadvantage, Strauss, the Carnegie Mellon professor, said — tantamount to a policy of " 'Don't ask, don't say. And everything's fine.' "
What might come next for assessments? Although Philadelphia has reassessed frequently, other counties have allowed decades to pass between mass appraisals because they are costly, unpopular, and political minefields. Delaware County is currently reassessing, but only because a judge ordered it. In that sense, Bright, the lawyer, said Philadelphia was simply doing the right thing. "Every county," he said, " … should do it." In Philadelphia, frequent reassessments also remain a moneymaker for the city. "Otherwise," he said, "it's a backdoor way of collecting taxes." Staff writers Meghan Bobrowsky and Michele Tranquilli contributed to this article.